The institution called Psychiatry is a fraud from top to bottom. The DSM’s 300 or more mental disorders are mostly opinions based on observations. A handful of top shrinks meet to create a consensus for each edition of this bogus manual. 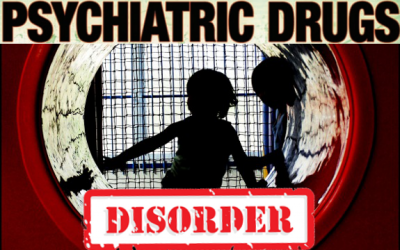 Even the creator of ADHD, an ‘illness’ responsible for hundreds of thousands of children receiving mind-altering drugs, has admitted that it is a fictitious disease. But a pact with the devil called Big Pharma linked these disorder opinions to imagined brain chemistry imbalances that could only be treated by profitable pharmaceuticals. The premise of brain chemical imbalances has never been scientifically established. It is bogus, and the notion that Big Pharma can come up with solutions without dangerous side effects is even more bogus. It wouldn’t be so bad if shrinks had stuck to talk therapy. Suicide and murder are among the worst side effects from those drugs when prescribed to teens and adults, many of whom ditch them after experiencing negative side effects. And those being prescribed the drugs to treat suicidal behavior don’t even get better. The drugs prescribed for toddlers include: Anti-anxiety drugs such as Xanax, Klonopin, and Ativan. Antidepressants like Prozac, Zoloft, and Paxil. ADHD drugs including Ritalin, Adderall, and Concerta. Anti-psychotic drugs such as Risperdal, Seroquel, and Zyprexa. Technically, this is all off label prescribing. Prescribing them for children under five is not FDA approved. Doctors and psychiatrists are getting away with this partially because most of these toddlers are in poor families, foster homes, or institutionalized. It’s easier for those in charge to deal with supposedly disturbed children under five by drugging them. And there’s nobody to file a lawsuit on their behalf. Babies and toddlers don’t have the option of ditching any drugs because of their side effects unless they die first. Such a case occurred not too long ago in Boston. The South Boston parents were jailed for murder. They were accused of intentionally over “medicating” Rebecca because they were frustrated with not being able to get federal Supplemental Security Income (SSI) compensation for her the way they had with her two older siblings, also on psychiatric drugs. The drugs that finally killed Rebecca, after being increased by Tufts Medical Center psychiatrist Dr. Kayoko Kifuji, were Clonidine for ADHD and Depakote for a bipolar condition, both diagnosed by Kifuji when Rebecca was two years old. Overdosed Clonidine was cited as the cause of Rebecca’s death. Rebecca’s case was a highly publicized event that outraged many because Kifuji was never even indicted. Many jurors that handed Rebecca’s parents the murder conviction were outraged that the psychiatrist, who prescribed Rebecca’s drugs, based on only a few office visits less than 15 minutes long and Mrs. Riley’s complaints, was never held responsible. Kifuji had surrendered her medical license until legal matters while she testified against the Rileys’ under immunity. Kifuji was defended by Tufts and reinstated when the trials ended. Some justice was managed by a Boston law firm that created an estate for Rebecca Riley’s siblings and filed a malpractice suit against Dr. Kifuji and Tufts Medical Center. Due to the publicity and the possibility of some dirty laundry being exposed, Tufts settled out of court for $2.5 million, the maximum amount their liability insurance would cover. After attorney fees, the money is being held in a trust for Rebecca’s older siblings. Meanwhile, Dr. Kifuji continues her “practice” with Tufts.